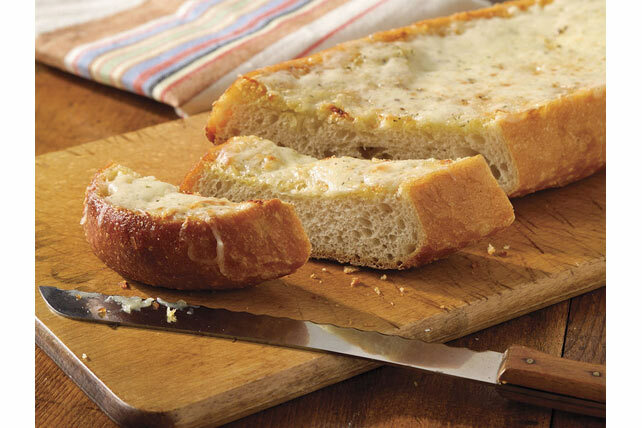 Make this gloriously crusty Parmesan-Garlic Bread just once, and you'll never buy the overpriced stuff in the freezer section again! Cut bread lengthwise in half. Place, cut sides up, in shallow pan. Mix margarine and garlic until blended; spread onto bread. Sprinkle with cheeses. Bake 15 min. or until mozzarella is melted. Cut each bread half crosswise into 6 slices. Serve warm. This crusty bread is the perfect accompaniment to your favorite pasta dish. Serve with a mixed green salad. Prepare as directed, sprinkling lightly with dried basil leaves before baking.